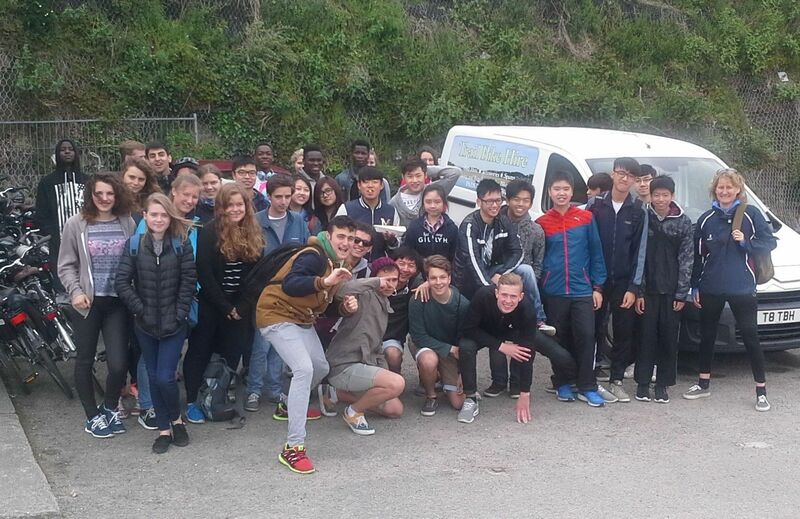 Home > News > Boarders' Blog > Pentreve Boarding – Fishing, Cycling and a Visit from BBC's The Voice! Pentreve Boarding – Fishing, Cycling and a Visit from BBC's The Voice! It is hard to believe that it’s May and the boys have just completed their second full week of the Summer term; before we know it we will be sitting in the sports hall in the Sir Ben Ainslie Sports Centre on Speech Day!!! The school certainly has an air of studiousness (even more so than usual) to it at the moment. Subject teachers are finishing off their syllabuses and within the next week revision for the end of year exams will commence. Mr Nicholas and I, Mr Barnett and Mr Pomery are all poised and ready to help guide the boys through the next few weeks and we are looking forward to them realising their potential and securing some first class exam results. I am expecting a flurry of visits to the nearby Staples store (stationary) with revision cards and highlighters being top of the boys shopping lists in the next week or so too. This week has, as always, been a busy one. On Wednesday evening we enjoyed our half termly Boarders’ Chapel Service. These services, led by the school chaplain provide a great opportunity for the boarding community to come together. The boarders, staff and guests reflected and prayed for all those affected by the devastating earthquake in Nepal and the Rev as always lead a poignant service. With the rugby and football season’s now over the boys have enlisted on to different and quite interesting Wednesday afternoon activities. I did laugh when Henry and Fabian told me they would be fishing….but it turns out they aren’t bad at it… maybe we should put in our orders and fire up the house BBQ Mr Nic? 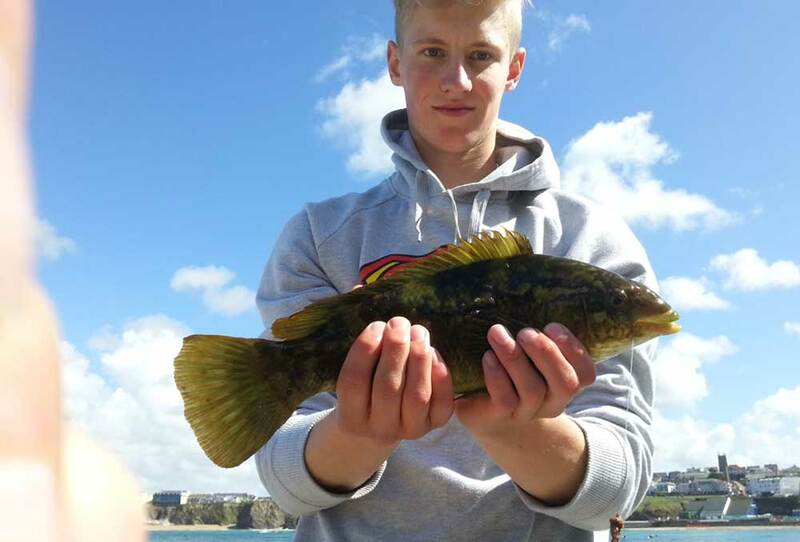 Fabian with one of last week’s catches! The weekend quickly came about and Friday was soon upon us. Nils and Alec attended chess club after school whilst the others returned home to the house in dribs and drabs. The weekly boarders left for the long weekend and we were soon down to nine. After supper the girls from Poltisco joined us in the common room for Mrs De Gruchy’s extra English class…this week cake was declined in favour of popcorn…anything to help to them focus on a Friday evening!!! At eight o clock most of the boys made use of the Sir Ben Ainslie Sports Centre for some basketball whilst those too tired entertained themselves in the house. On Saturday morning I peered out of my window hopefully to see what the bank holiday weekend had in store for us weather wise…mizzle and clouds. It seemed the boys may have done the same but decided to retreat back to bed as when I did the rounds at wake up there were some very grumpy grunts of ‘good morning Miss’. For Alec and Nils there was no time to think about the weather. They were up and out early for the County Chess Tournament. The rest of us made our way to brunch and a hearty plate of sausages, bacon, eggs, hash brown etc were wolfed down. The rest of Saturday was a free day for all. The boys visited town, dominoes and Tesco’s. Some skate boarding was enjoyed and Bryony joined Cyrus in the office for some singing practice. Fabian left to spend the evening at Henry’s and Alec and Nils returned just in time for the house cinema trip having finished third and fifth respectively! So, off to the cinema they went…this week’s showing? Fast and Furious 7. The opinion upon return? Great, but sad!!! The customary pizza evening then followed, and another film, this time James Bond, kept the boys entertained until bedtime. On Sunday, again the weather was miserable so we headed off to Newquay after brunch. The boys spent nearly three hours enjoying the flumes and rapids at Oasis Fun Pool, an indoor water park. With fingers shrivelled like prunes they finally emerged from the changing rooms and made their way straight into the arcade. The various arcade games were explored and the 2p machine came out as a firm favourite. Alas…no millions were made and so we headed back to Truro. 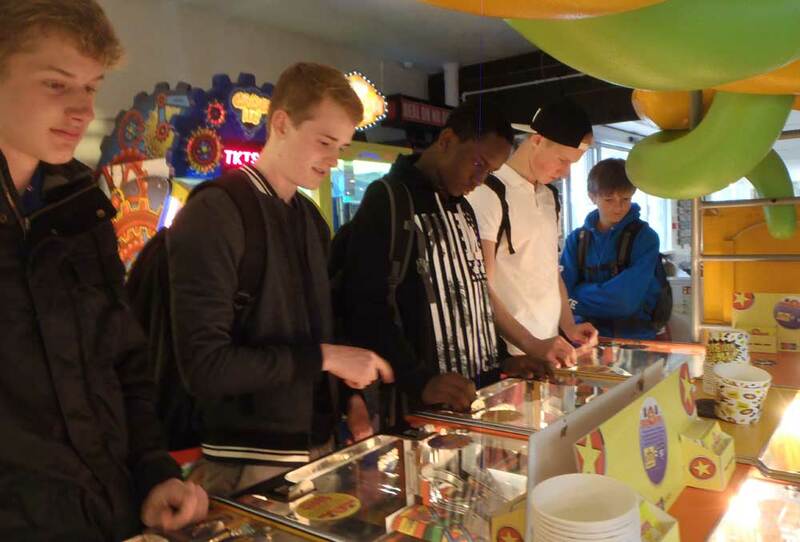 Nils, Fabian, Colin, Ayobami and Harry trying their luck with the 2p’s! Mr Mulready fired up the BBQ upon our return and a quick ‘snack’ of sausages and burgers were enjoyed. It was then time for supper and Cath’s Curry Night where an array of spicy curries, naan breads, poppadum’s and Indian side dishes were laid on. Later on in the evening Fabian, Nils and Colin headed off into town with Lara, Nicole, Svenja and Margot from Poltisco for a Chinese meal…quite where they put all this food amazes me week in week out. It was great to see the junior houses mixing so well and with a number of new students in this term it was lovely to see them making the effort to socialise. The girls were even treated to an hour of pool and table football on their return!!! With no school the next day, the boys begged for a later night and some television in the common room saw out a busy day. Bank holiday Monday was a special day for Cyrus…his 16th birthday and the day he had been waiting for all weekend….audition day. Cyrus headed up to the school early and joined the queue of hopeful singers all vying for a place on the next series of The Voice! We will watch this space and wait to see if he has been successful. 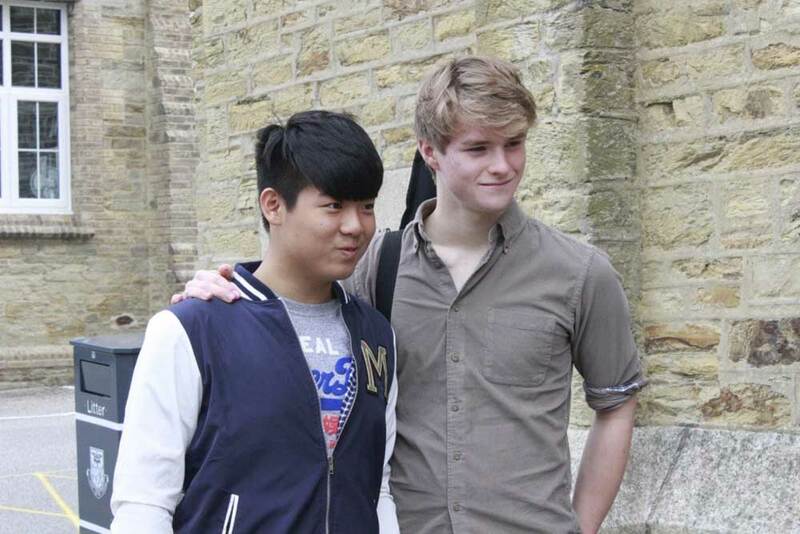 Truro School Pupil Cyrus (left) and Patrick (right) pictured together after The Voice auditions. It was then time for brunch before all the boarding houses headed off to Wadebridge and the Camel Trail. Bikes were sorted and the journey began but unfortunately not all made it to the picturesque fishing village of Padstow…Nils took a tumble on the way out, a rather drastic way of getting out of the cycling, and was instead chauffeured back to Truro, via Treliske hospital, in an ambulance…boys will be boys and we hope Nils recovers from his broken collar bone quickly!!! For the rest of the party an hour was spent exploring the quaint harbour of Padstow with its typical Cornish shops, Cornish clotted cream ice cream and world famous Rick Steins Fish and Chips. The cycle back saw some aching legs (and bottoms). Appetites were worked up and all involved certainly deserved the mountains of Cath’s Fried Chicken that awaited them at supper. With school work back on their minds the boys spent Monday evening completing prep and getting their bags ready. Bedrooms were tided, laundry sorted and the boys went to bed without fuss following their busy long weekend.